Make It A Blast provides a variety of entertainment for kids parties. Our services include balloon artists, face paining, dance instruction, dance parties and a photo booth. We can package entertainment together to give you variety. 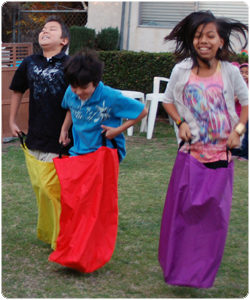 Kids party entertainers for San Diego. Face painters, balloon artists, game leaders, dance instructors and more! We are experts at kids entertainment and interaction. Let us take care of your party entertainment. The key to our success is the way we package entertainers together that you would normally hire separately. We offer face painting, balloon twists, game leaders and kid friendly music in our most popular package. Make it a Blast is owned by a teacher and we employ a lot of students studying to be teachers. Entertainment for kids parties packaged for you! Combine face painting, balloons, games, and more! To figure out what mix of entertainment would be perfect for your child's birthday party, corporate event, family reunion or other kid event in San Diego County, visit our packages page. Contact us if you need suggestions based on factors like the location, age of kids, and time frame. We are experts at entertaining kids. We entertain kids at a variety of events. Our packages are great whether you’re planning a small gathering, or a huge company picnic. But if you need custom entertainment options, let our expertise guide the way. For example, we had a client planning a huge event near the beach. We set up 4 play areas with 6 entertainers and we adapted all of our games to be beach themed. We also led the kids in kite flying sessions. Another client hires us every year to entertain children in 3 hotel ballrooms. The kids are divided by age range so we use games and obstacle courses for the little ones, face painting and balloon for the middle age range, and a photo booth and music for the older group. Talk to us about your event and we’ll make it custom for you. Finally, a photo booth for kids! Make It A Blast is now proud to offer a photo booth made just for kids. The photo booth gives them an automated countdown like a real photo booth experience, and then prints their photo strips on the spot! Your guests get a printed copy of the photos right away. Each photo strip with be imprinted with custom text, such as the birthday child's name and graphics to compliment party theme. Check out the kid photo booth page. Our team at Make It A Blast is multi talented. Each team member is trained in multiple skills. Face painters learn to twist balloons, and ballon artists learn to run a dance party and lead games. This means we can package our entertainment so you don't have to choose between balloons or face painting. You can have both! Entertainers for children's parties. We can provide balloon artists, face painters, DJs, photo booths, game leaders, dance instructors and more.